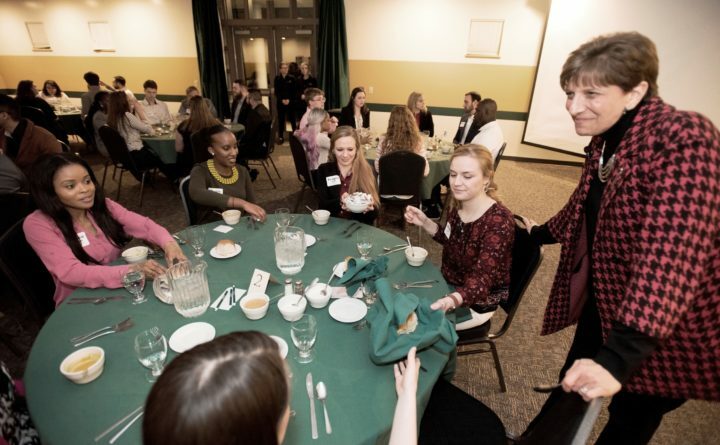 BANGOR – Husson University will host an etiquette dinner 5:30-7 p.m. Monday, March 25 at the Richard E. Dyke Center for Family Business, 64 Kagan Rd. The event is designed to teach Husson students some of the finer points of good table manners. Mastering these skills will help the students make positive impressions when interviewing or attending business meetings at formal banquets and restaurants. The students are required to attend the dinner in professional attire. The event begins with an overview of proper etiquette, followed by a four-course meal. Ms. Jean Papalia of A+ Etiquette will coach the students on appropriate table manners. Everything from the proper use of napkins, utensils, conversation, and personal behavior will be covered during the event. This formal training gives students the opportunity to feel more confident in professional social situations.